Tonight I stumbled across a web site which features a CD of Amy Carmichael's poems set to lush, orchestral music, sung by incredible soloists. You can actually hear sound clips of each of the songs. I can tell you...I'm going to order this one! 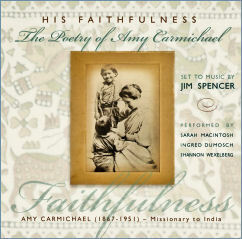 His Faithfulness is a refreshingly reflective musical offering combining the rich poetry of Amy Carmichael, 1867-1951, (Irish missionary to India, read more), and the stirring melodies of modern-day songwriter Jim Spencer (Reason for the Rain - Word Records, I'm Gonna Lift Up My Eyes - Lynda Randle for Feed the Children). From the intimate piano/cello arrangement of Rose from Brier to the soaring strings of On Calvary’s Cross, there is a wonderful cohesiveness to this project that provides the sense that you are not simply listening to ten individual songs but that you are gazing upon one grand tapestry; the testimony of God’s great faithfulness in the life of one of His children that will resonate with all. His Faithfulness enjoys the contributions of some of the finest musicians of our day, including the fabulous production skills of Dan Israel; the inspiring piano arrangements of Brett Turner Francis; the masterful string arranging and conducting of Carl Marsh (Mercy Me, Steven Curtis Chapman, Point of Grace); Nashville’s finest string players; and the gifted vocals of Ingrid Dumosch (vocalist/vocal arranger, CN Productions, UK; vocalist, Daywind Music, Integrity Music), Shannon Wexelberg (Discovery House recording artist, performances with the Brooklyn Tabernacle Choir and Integrity Music) and Sarah MacIntosh (former Sparrow Records recording artist, background vocals for Michael W. Smith 2002 Worship Again & Come Together and Worship Tours, Horizon Music recording artist). His faithfulness ... that sounds wonderful ... and i am literally praising God for HIS FAITHFULNESS re the condo we bought yesterday ... can't believe how quickly it all happened ... i am thrilled to bits!!! Good news, Saija! I'm so glad for you and Leo!